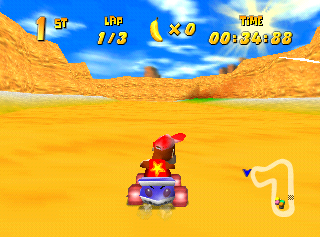 Diddy Kong Racing is like Mario Kart but with more interesting tracks and a long unskippable intro. And lots of it, too. 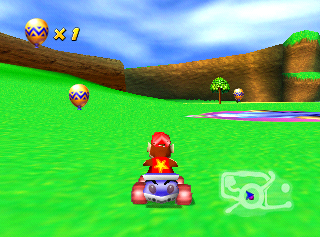 Applying the below GameShark code will display various debug objects in the current map, normally unseen. 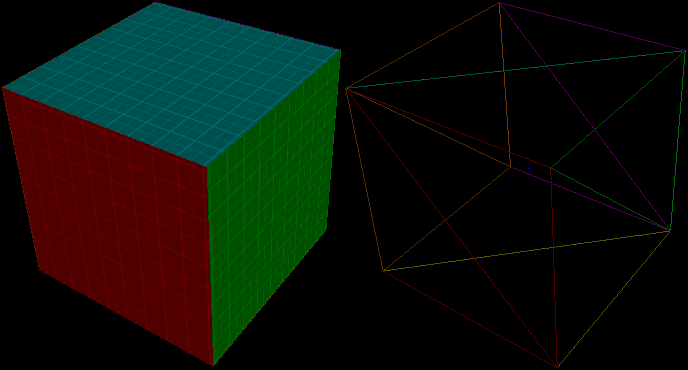 A simple debug display showing the current colors being rendered in the area can be displayed with the below code. 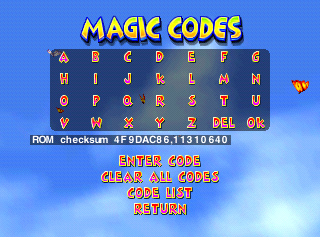 Present in the game is a crash debugger that can be enabled by entering the cheat EPC in the Magic Codes screen. You'll also need a memory card plugged into the first controller. 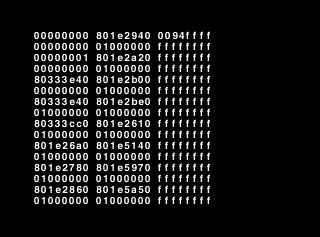 When the game crashes, reset the console and the crash debugger will appear. It'll quickly flip through four different pages automatically. Resetting the console again will boot up the game normally. 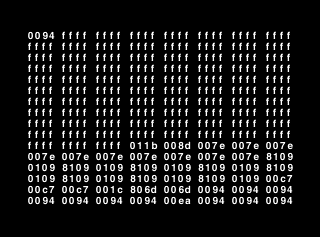 The first screen shows the type of crash and a register dump. 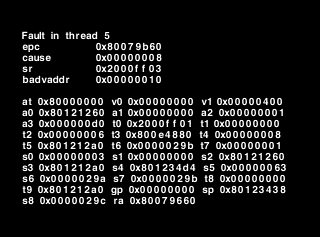 The second and third screens show a stack dump. The fourth screen is unknown. 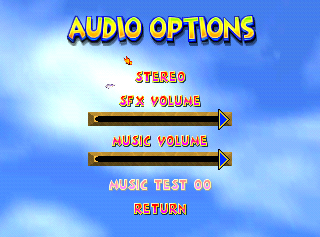 A sound test is accessible by the cheat code "JUKEBOX". Sound test track 12 ("sea_2b" internally) is an early theme for Crescent Island but was cut in favor of a different song. 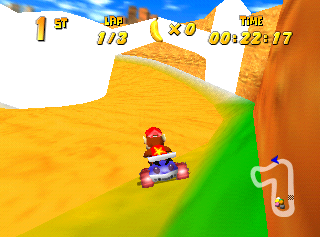 The character-select music changes its lead instrument depending on the character highlighted by the player. Within the track, there is a MIDI channel for a sitar lead which cannot be triggered under normal circumstances. This may point to Taj the genie being playable at some point in development as the track shares its sitar with his other in-game themes. Taj would eventually be made playable in the game's DS remake. A sound effect for the pterodactyls seen throughout Dino Domain tracks. 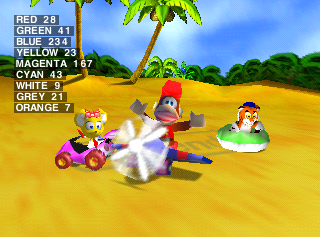 It seems that you were able to hit them at one point, but in the final game, you can't interact with them in any way. A sound of a car driving by. A voice clip of Taj saying "It's a balloon". A sound effect likely meant for a menu. An unused missile firing sound. A sound for some kind of trap. A couple of cartoon sound effects. It's unknown how they would've been used. There are some unused/debug cheat codes in the game. 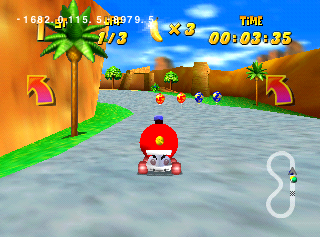 Some are still enterable, others have been changed to a string of numbers, rendering them unenterable due to the convenient lack of numbers on the cheat code entry keyboard. To unlock all cheats, including the unused ones, use one of the below GameShark codes. 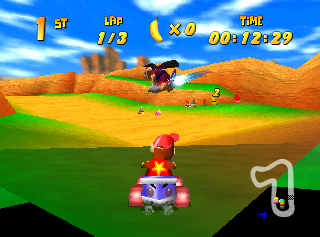 High Speed Racing (code 1234567890): According to Nintendo Power(?) 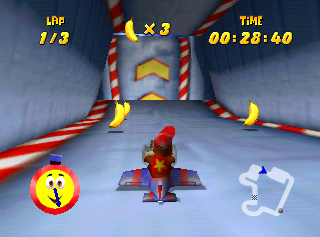 this would have increased everyone's top speed or maybe just done the same thing as the "No Limit To Bananas" code. It's listed in the official strategy guide, which helpfully doesn't give you the actual codes. It doesn't appear to do anything if enabled. Presumably it would have been an ordinary cheat code that could actually be entered at one point. 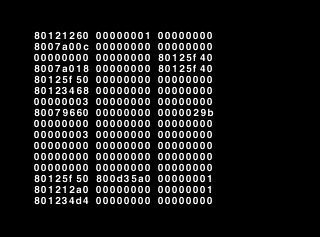 Print Coords (code 8846325012): Displays player 1's coordinates in the upper left corner of the screen. EPC Lock Up Display (code EPC): If the game crashes, next time it's powered up it will display a crash report screen, which isn't very usable as it flashes through several pages quickly. Control TT (code 1058732594) and Control Drumstick (code 8649305321): Actually implemented as cheats. When you unlock these characters, these cheats show up in the menu and can be toggled on and off. 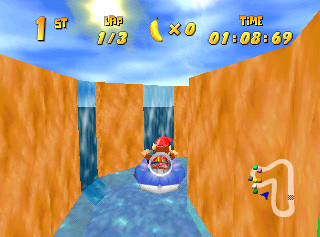 Mirrored Tracks (code 0986754321): Appears to do the same thing as Adventure 2. 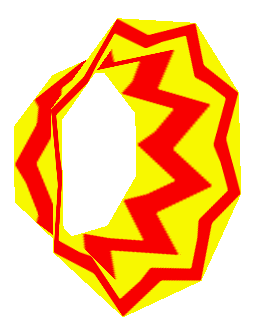 A logo for Pro AM 64, likely from an early version of Diddy Kong Racing before Diddy was in the game. A second Pro AM 64 logo. 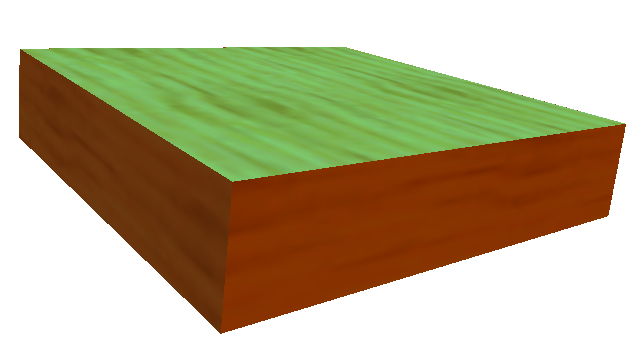 There is no palette associated with the texture. 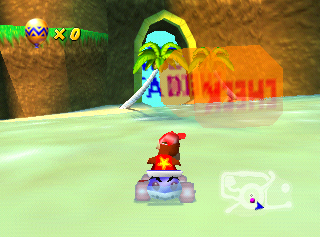 A small, earlier version of the Diddy Kong Racing logo. The palette here is guessed, as one couldn't be found in the ROM. A German video of a prerelease version (labeled "1.964 VERSION") shows that it was once used on at least one of the arches seen throughout Greenwood Village. A series of icons used for an early version of the character selection menu. 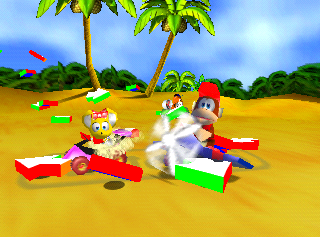 Note that icons for Diddy and T.T. do not exist, while Banjo, Conker, and Timber's icons only have placeholder text. These likely came from a period when the game was called Pro AM 64. Crudely-drawn placeholders for the signs in the lobby of Sherbet Island. A sign for Twilight City which matches those found in the Future Fun Land lobby. The sound effect for when T.T. says "Star City" is internally named TWILIGHTCITY, so this is likely an early name for that track. An early T.T. Challenge door. 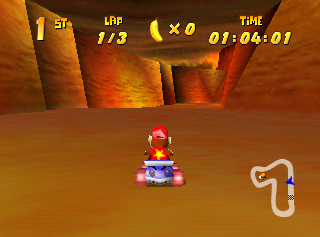 2D image digits 07, 09, and 0B are unused HUD maps. The first map is maybe a early version of the map for either Greenwood Village, or Jungle Falls. The second map has not been found. 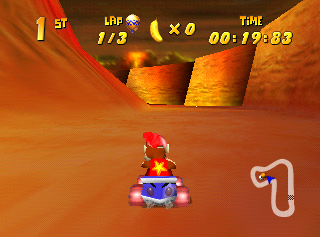 The third map matches the first unfinished track in the second video below. Presents hanging from red and blue balloons. A torch with googly eyes. A bunch of development-related signs and symbols. These icons show up on tracks when viewed in a setup editor as markers determining certain functions of the game, such as checking your progress on a track, silencing/enabling a MIDI channel, or warping the player to another area. A golden Rare coin. 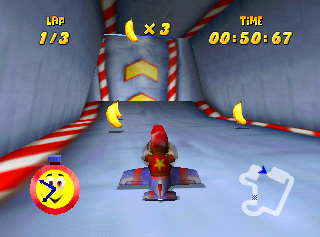 These coins were replaced with bananas to fit this game's atmosphere better, though these would have functioned the same. Individual letters of "RARE". 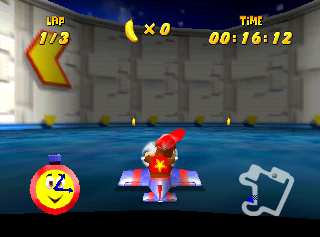 Likely used instead of the silver N64 coins in the Coin challenges. Player selection graphics rendered in a strange font. An early version of the Ancient Lake sign. A door with a silhouette of a balloon that has a question mark on it. A graphic that was likely meant to be used in Spacedust Alley. A fan blade intended for the air vents in Spaceport Alpha. Textures for an unused skybox. An earlier version of the Taj pad found in the hub world. 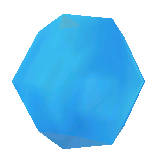 This texture is actually present in the map used in the cutscene that plays when you unlock the first Wizpig race but is never shown on screen. 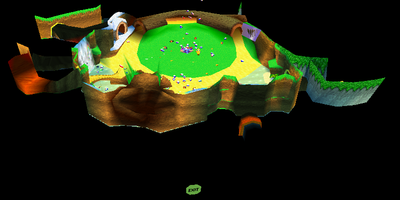 The map itself is also based on an earlier version of the hub world. 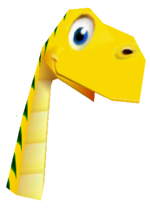 An unused sea creature that most likely would have appeared in one of the Sherbet Island tracks. Internally, it is assigned to two model IDs. ID 00F1 is named setuppoint and ID 00F2 is named SeaMonster. 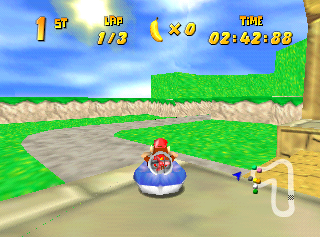 Many areas of the game, when viewed in a setup editor, display the setuppoint variant of the model. Judging from their locations, they appear to dictate where the players or NPCs such as Taj or T.T. will spawn. Four balloons numbered 1-4. They're only modeled on one side, so they were likely used in the character select. Three speed signs likely intended to be scenery. 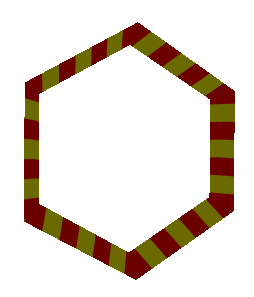 An early version of the plane zipper. 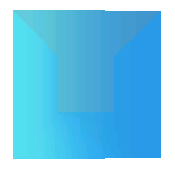 A multicolored arrow. It shows up in a level editor and seems to be related to animations. 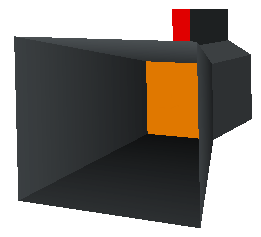 A camera that is used in cutscenes to represent where the actual camera is. It's never visible in game because it's always off screen. 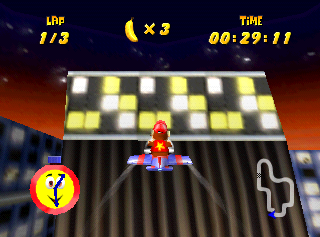 It also appears in Jet Force Gemini and Mickey's Speedway USA. Balloons for each of the playable characters except Diddy, Conker and T.T. A very small platform that would've been used somewhere in Dino Domain. 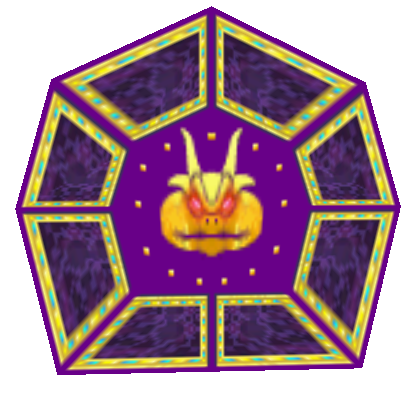 An unused Wizpig door that would've likely been used in the Future Funland Wizpig track since the area where Wizpig's throne is has similarly shaped openings. 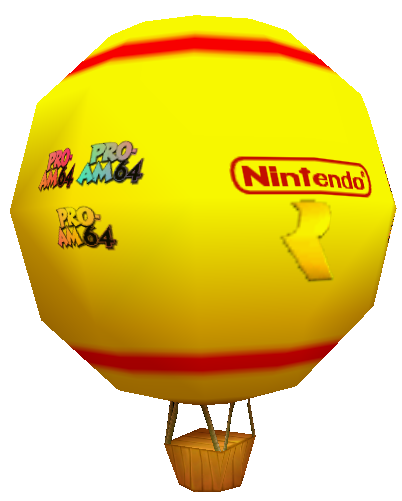 A balloon that has three Pro AM 64 logos, the Nintendo logo, and the Rare logos. It likely would've been used in a logo sequence at the startup. A sign with a red balloon on it. Three towers with the heads of Wizpig, Smokey and Tricky at the top of them that would've likely been used somewhere in Future Funland. 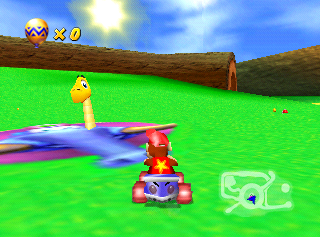 Models for Bluey and Bubbler don't exist. 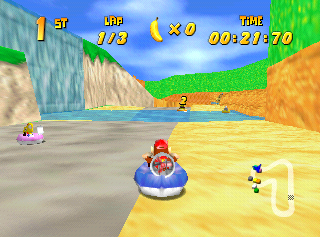 All unused tracks can be accessed using the above patch. Only two of them can be accessed with GameShark codes. 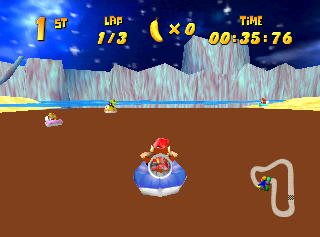 An unfinished track that looks like an ordinary track, but isn't circular. 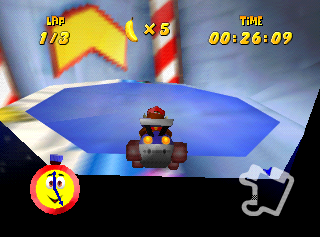 The AI racers just drive around seemingly randomly. One of the arches is untextured. 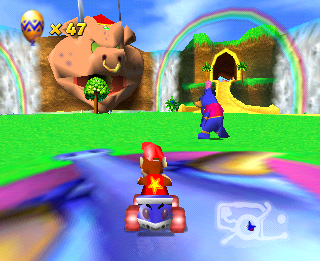 In the U V1.0, E V1.0, J versions of the game, Wizpig appear in the map on his rocket and flies in a set path. This map was likely used for testing the AI. 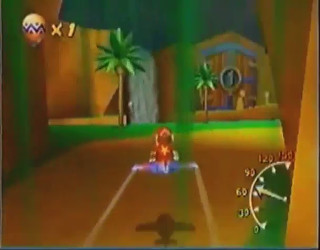 The Adventure mode intro cutscene uses an earlier version of the main hub world which contains a few differences compared to the final version. Since this map can't be explored normally, these differences can't be seen. Behind the starting point, the log has a chunk cut out of it that was filled in for the final version. 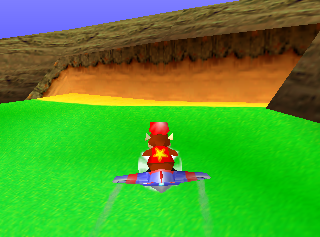 The area leading to Snowflake Mountain was originally a grassy area. 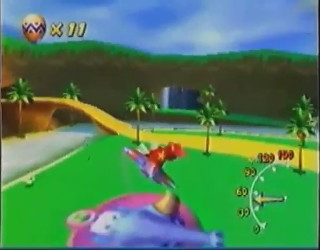 The area can actually be seen in its completed form in an old German promo video. The tunnel leading to Dino Domain was originally much longer and had some vines growing in it. 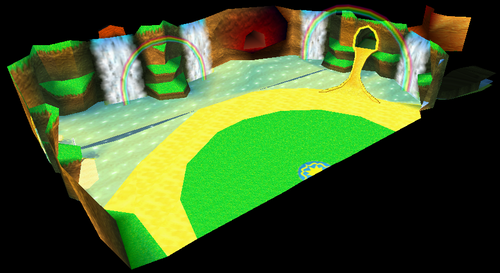 This map contains an out of bounds warp which can be seen at the bottom of the image. A cube with a different color for each face. This map is actually loaded into memory during certain menus but is never visible in game. 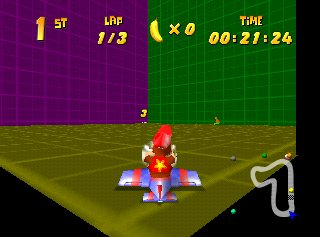 This map also exists in Mickey's Speedway USA and Jet Force Gemini. 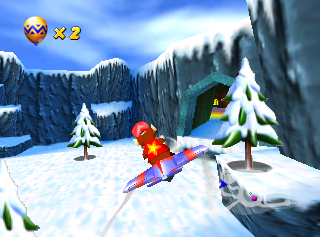 A snowy version of the Dino Domain boss track. Other than being slightly shorter, this map is mostly the same. 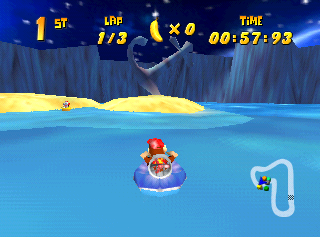 A lagoon map that seems to be an early version of Darkwater Beach. It has an anchor and some trees which use the same textures as the walls. A volcano themed track that seems to be an early version of Hot Top Volcano. 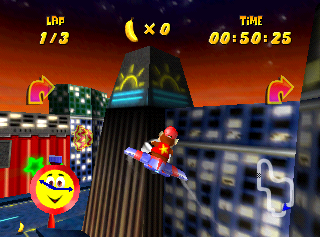 Note: the balloon seen in the first screenshot isn't part of the level. 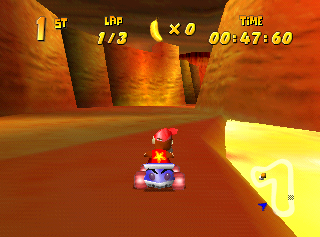 A track that is very likely an early version of Jungle Falls. 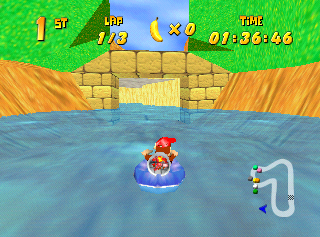 Several waterfalls, a tunnel, and a pyramid can be seen. 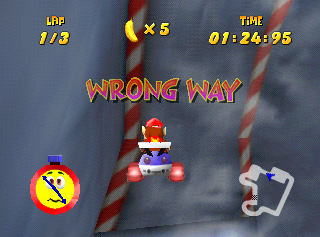 The collision doesn't always match the track model, so you'll sometimes be floating in the air. 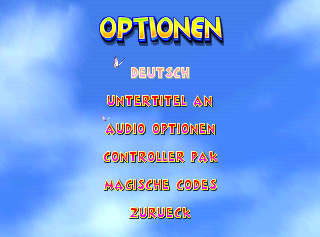 Aside from the English and French options in the menu in the USA version, there are German and Japanese options, though the latter is not quite finished as it replaces much of the text in the game with placeholders. Code 81084542 0001 replaces French with German in the menu; 81084542 0003 replaces with Japanese. A couple of build dates are intact in the ROM. 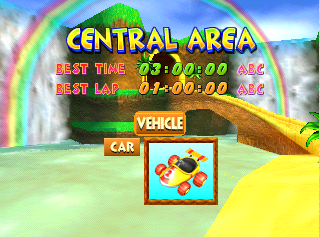 Levels in the game that don't contain any time trial records, like the hub world, will use a default record of 3 minutes with the best lap being 1 minute and with the name ABC. 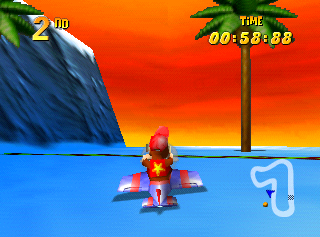 Present in the game are two unused vehicles which can be selected using one of the below GameShark codes. 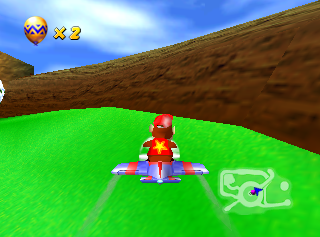 Vehicle ID 03 appears as a car without any wheels that can fly like a plane, but unlike the plane, this vehicle doesn't lose altitude when slowing down. Vehicle ID 04 appears to be a duplicate of the car except you can't control it. In most tracks, it'll just crash the game. 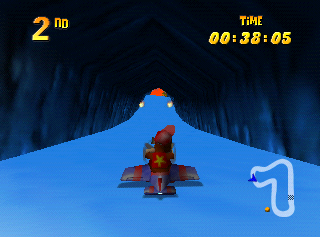 The wall textures for the tunnel in Spaceport Alpha are different in the Japanese version of the game. 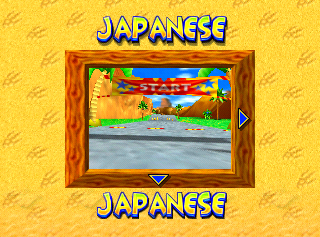 The North American and Japanese versions of the game render at 320x237 while the European version renders at 320x261. 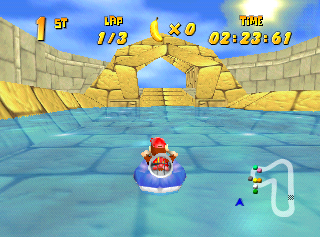 Only certain HUD elements take advantage of the higher resolution since the view is just stretched vertically. Some revisional differences exist, most of them are to make Spaceport Alpha slightly easier. 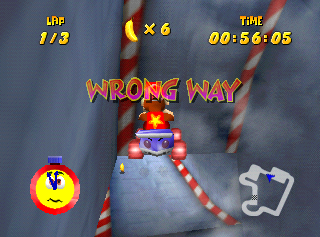 After defeating Trickytops or Bluey for the first time, Taj tells you a gameplay tip. 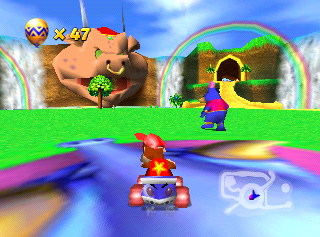 In 1.0, Taj speaks during the accompanying jingle, but in 1.1, his voice clip is delayed until afterwards. The infamous "wrong warp" glitch from Hot Top Volcano works differently between versions. In 1.0, the game crashes once you go through the loading zone, but in 1.1, it warps you to the main hub world, loading the data from file 1. In the Japanese version of the game, the loading zone warps you to either the main hub world or Dragon Forest. This glitch can be heavily abused to beat the game in under an hour. 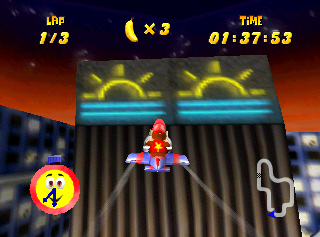 In Star City, a neon sign of sun was replaced with the N64 logo and some squares in the 1.1 version. The Killer Instinct logo in Star City was removed. A space ship graphic in Star City doesn't animate in 1.1. 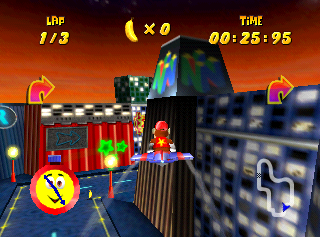 In the Japanese version, one of the walls in Spaceport Alpha has a hole in the top, which you can go through with a well timed loop-de-loop, allowing you to go out of bounds on the track. 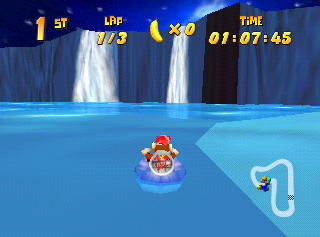 For some reason, this hole doesn't exist in any other version. 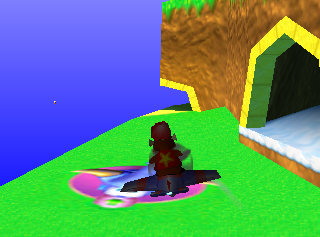 The vent's graphics were changed to a somewhat glitchy blue texture. 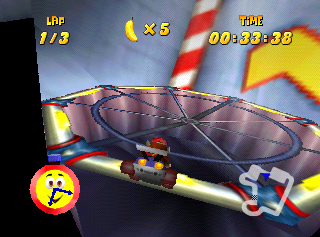 A wall was added near the vent to prevent players from going the wrong way. 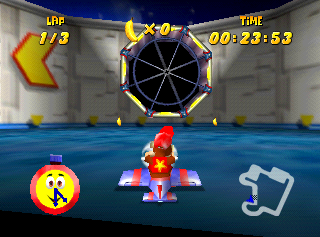 The hole directly behind the starting line was removed likely so that it wouldn't confuse players. 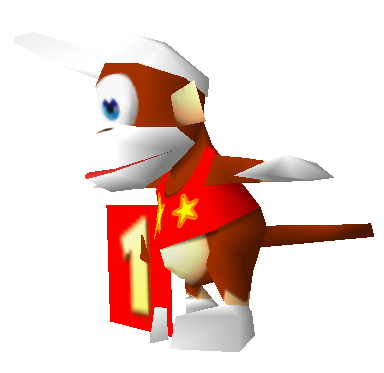 In the player select screen, Diddy Kong has a tail, but it can not be seen due to the camera angle. The object corresponding to Taj is known as Parkwarden internally. The Jungle Falls music has the name boss_1a. 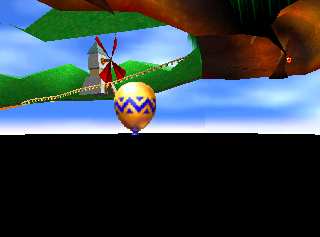 Underneath the Dragon Forest boss track is an unreachable golden balloon. 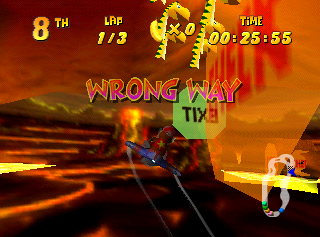 For whatever reason, a normally inaccessible warp exists underneath the starting line in Hot Top Volcano (the green octagon in the screenshot). Where it warps you depends on the version you're playing. 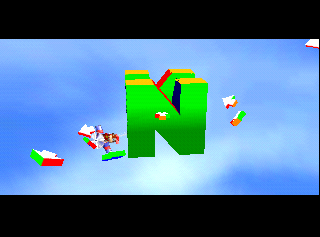 All areas from the title screen sequence are on the same map, albeit extremely spread out. 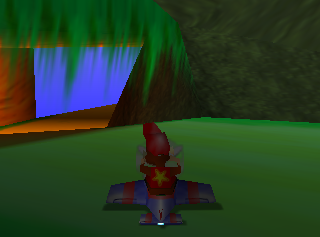 Boulder Canyon has a height limit for planes even though only hovercrafts can be selected in that track. 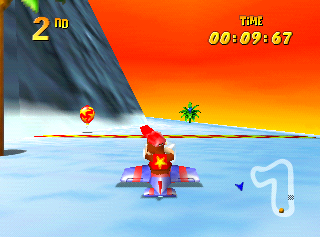 It's possible that planes were going to be selectable as well in that track. Next to the starting line in Spaceport Alpha is an empty alcove that serves no real purpose. 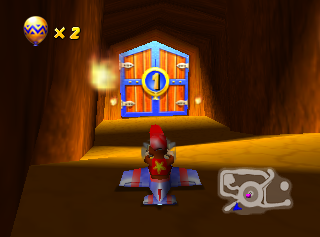 It's possible that Future Fun Land was going to have a battle mini game as well like the first four areas and that the key to unlock the door would've been placed here. 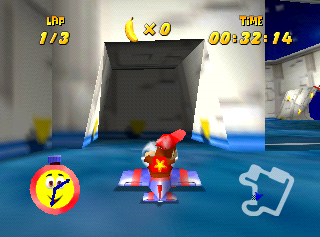 The DS remake has a Power-Up Token placed inside this alcove.